It’s the 350th anniversary of the Great Fire of London ands we thought we’d take a quick look at what happened in the aftermath. With much of the city razed in the four day fire of early September, 1666, attention quickly turned to the rebuilding of the City and within just a few days, proposals began coming in for the recreation – and transformation – of London. Christopher Wren, John Evelyn and Robert Hooke were among those who put forward new designs for the city along with the likes of one Richard Newcourt, whose proposed rigid grid featuring churches set in squares wasn’t adopted for London but was eventually for the streets of Philadelphia in what is now the United States of America. None of these plans – Wren’s vision had apparently been inspired by the Gardens of Versailles while Evelyn’s was an Italianate city with wide piazzas – were eventually adopted, however, thanks largely to the difficulty in working out who owned which properties in the city (people had more on their mind, such as survival perhaps). In October, 1666, King Charles II – who had encouraged many of those left homeless to move out of the City out of fears that a rebellion was in the offing – joined with the City authorities in appointing six commissioners to regulate the rebuilding (a key factor in which was the mandatory use of brick in place of wood). Their actions were supported by a couple of parliamentary acts – drawn up to regulate the rebuilding and allow for the opening and widening of roads, among other things – and the establishment of specially convened Fire Courts to deal with property disputes (owners had to clear roadways of debris and establish their rights of ownership before they could start reconstruction). Rebuilding was, not surprisingly, to take years – after all, almost 400 acres had been burned within the City walls and 63 acres outside them with more than 80 churches, 44 livery halls and more than 13,000 houses among the casualties. And it was patchy with new buildings standing alongside empty blocks awaiting reconstruction. Construction of the many grand public buildings destroyed in the fire, such as St Paul’s Cathedral, would also take years (the cathedral, Wren’s Baroque masterpiece, wasn’t completed until 1711). 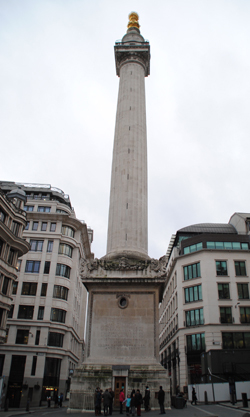 PICTURE: The Monument, which commemorates the Great Fire of London, is among the works of Sir Christopher Wren (for more on the Monument, see our earlier post here).